Who will be the 2014 Formula 1 champion: Lewis Hamilton or Nico Rosberg? 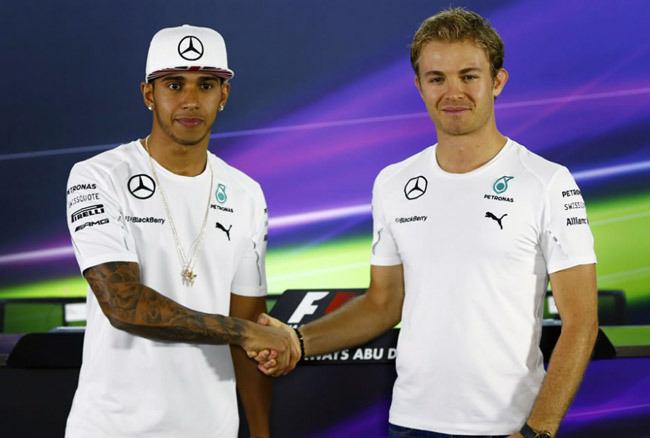 Who will be the 2014 F1 champion: Lewis Hamilton or Nico Rosberg? Tonight, at 9pm Philippine time, the last race of the 19-leg 2014 Formula 1 season will be held in Abu Dhabi. With Mercedes AMG Petronas having already secured the constructors' title, only one thing remains to be settled: Which of the team's two pilots will be crowned the drivers' champion? On top of the standings is Britain's Lewis Hamilton, who has amassed a total of 334 points. That tally is the result of 10 race wins, three second places, two third places and three DNFs. Whenever he completed a race, he never finished lower than third place. In one word: dominant. Next to him and the only driver with a chance to steal the title is his very own teammate, Germany's Nico Rosberg, who has collected a total of 317 points. His digits are the outcome of five race victories, 10 second places, one fourth place and two DNFs. In a word: consistent. But forget about their total scores for now. Just remember one number: 17. That's the number separating the two right now, which means Rosberg needs to score 18 more points than Hamilton in today's race if he hopes to wrest the championship trophy from his childhood friend and current nemesis. Now, the permutations are a lot more complicated, because for this season-ending Abu Dhabi Grand Prix, the points will be multiplied by two. Double points, in other words. This rule was adopted for this season as Formula 1's powers-that-be wanted the fight for the championship to be alive as deep into the season as possible--hopefully until the very last race, which is exactly the case we have now. So instead of just 25 points, the winner today will be awarded 50 points, the second-placer will get 36 points, the third-placer will receive 30 points, and so on. To many fans of the sport, this is a shame because this could award the title to a less-deserving driver all because he scored double points in the last race. And imagine if the most triumphant driver this season (Hamilton with 10 wins) loses the title just because another driver crashes into him on the opening lap. Nevertheless, a rule is a rule. So let's do the math. Obviously, it's going to be a tall order for Rosberg, who took pole position in qualifying yesterday. Then again, it's not going to be easy for Hamilton, who is lining up the grid in second position. Who do you think will raise the championship trophy at the end of the race? Take our poll. Will PH market see new mini cars from Ford and Chevrolet soon?